The Twin-spotted Rattlesnake is found in the pine and oak forests of southeastern Arizona, south to northwestern Mexico. It lives at relatively high altitudes of 6,000 to 9,500 feet. 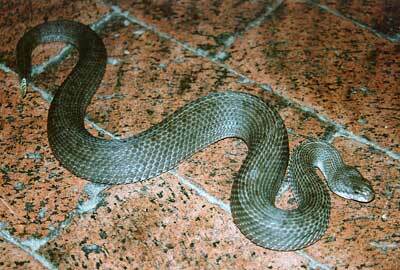 Its popular name refers to the double row of dorsal spots running most of the snakes length. It is active in the daytime (diurnal), preying upon lizards and small mammals. Very large adults may be two feet in length but, 18 inches is an average size. In mid-summer up to eight young are born alive, six to eight inches long. All rattlesnakes, most other vipers, boas and garter snakes are born alive (viviparous) while most cobras, pythons, kingsnakes, bullsnakes and rat snakes are hatched from eggs (oviparous).